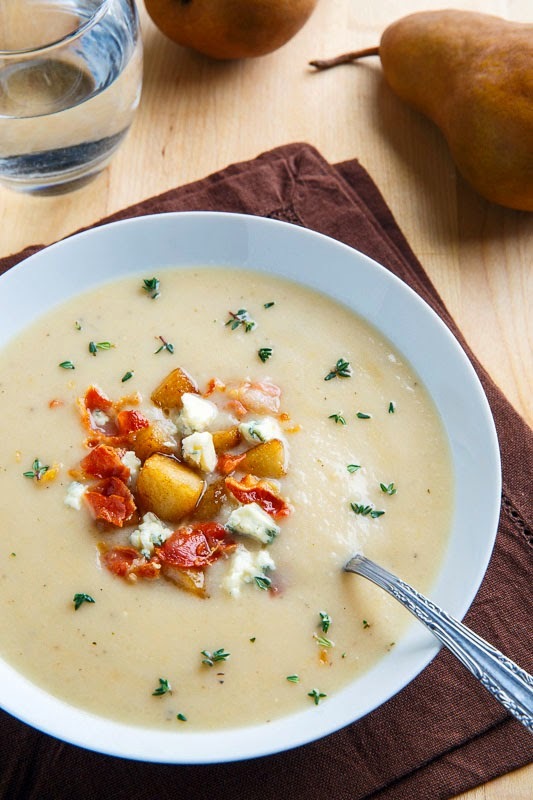 A caramelized pear soup with a hint of blue cheese where the combination of sweet and savoury will blow your taste buds and your mind away with how heavenly good it is! It’s time for another warm comforting bowl of soup for these cold winter days! 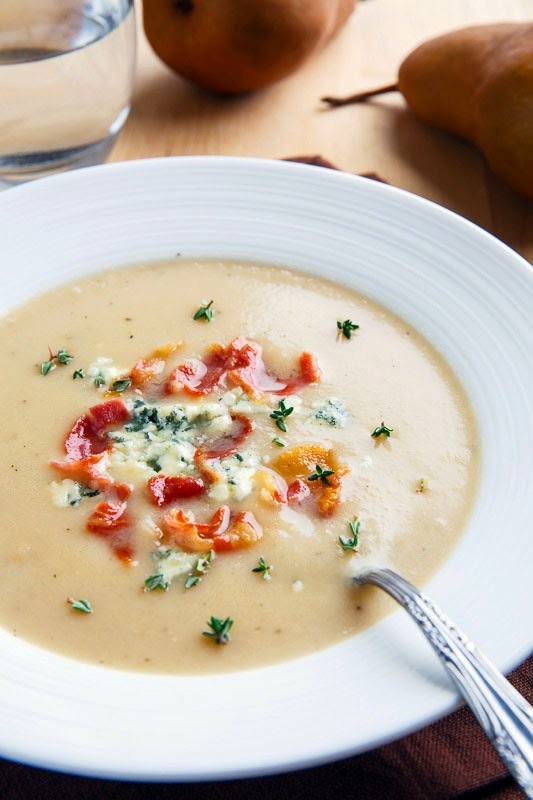 At first this pear and blue cheese soup might sound a little strange but the combination of pears and blue cheese can be a magical one; the trick is that you need to be careful not to overpower the delicate flavour of the pears with the strong flavour of the blue cheese. This soup starts off by caramelizing the pears in butter and brown sugar to add a little to their sweetness and to bring out more of the pears flavours. From there the recipe is pretty much a simple soup recipe where you cook some onions, garlic and thyme before adding the broth along with some potatoes to thicken the soup a bit, simmer until tender, puree and add the blue cheese along with some cream. I have to say that the sweet pear and savoury blue cheese combo is an absolutely fabulous one and it works amazingly well in this soup! 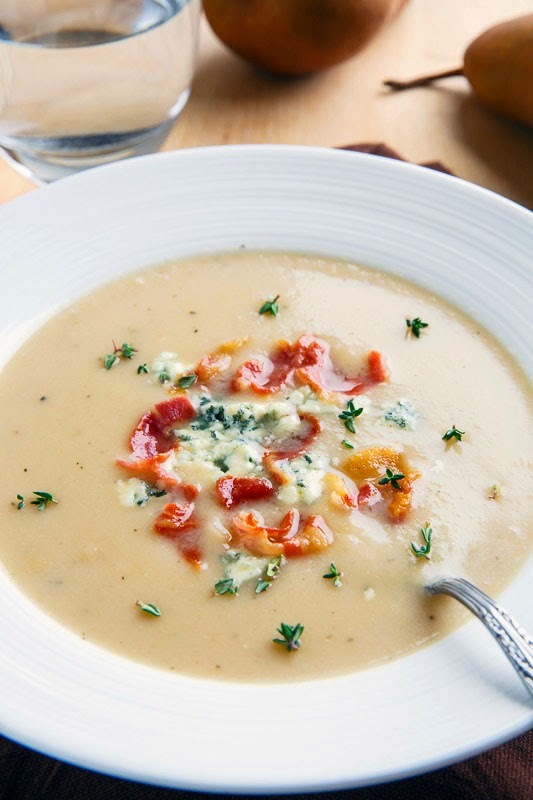 As good as the soup is just like that it benefits from the saltiness from a garnish of some crispy fried pancetta or bacon; a must in my books! No matter how you make it, this soup is pure comfort food that will warm your soul through the dead of winter! Serve garnished with chunks of caramelized pear along with more crumbled blue cheese and optionally the crispy fried pancetta. Add the onion and cook until tender, about 3-5 minutes. Add the garlic and thyme and cook for another minute. Add the broth, cream and potato, bring to a boil, reduce the heat and simmer until the potatoes are tender, about 10-15 minutes before pureeing in a blender or food processor. Turn off the heat, return the soup to the pan, mix in the blue cheese, let it melt and season with salt and pepper to taste. Note: I like a mild blue cheese for this like a gorgonzola dolce which is a younger gorgonzola that is milder and creamier than a fully aged gorgonzola but any blue cheese will work so use your favourite. Note: Add the blue cheese a bit at a time, you want it’s flavour to be present in the soup but not to overpower the pears delicate flavour. Oh my goodness, Kevin! This sounds marvelous!! The flavors make me want to drink the entire pot! This is such a hearty and lovely soup! 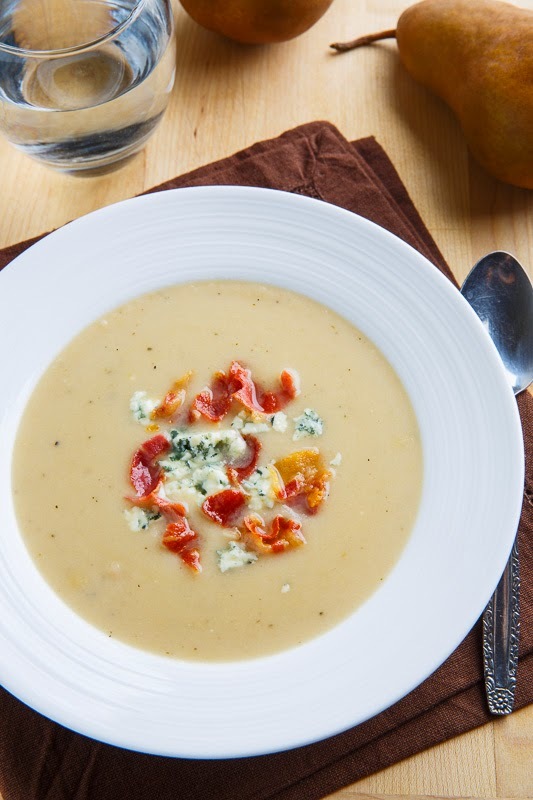 I've never had pear in my soup… Or blue cheese in my soup… And now I want both- togther! Ooooooh…. caramelized pears! What a fantastic idea! Pears in soup is such a great idea Kevin. Can't wait to try it out! Amazing soup, would be delicious this weekend with that cold we are having. Kevin, I absolutely LOVE the pears in this soup!!! WOW!!! what a great flavor combo you have here and the chunks of caramelized pear, blue cheese and the crispy fried pancetta on top is perfection! I love this soup! This is such a great mix of flavors, I love it! You've gotten really good at slipping blue cheese into everything and I love it! I just started using pear in savory dishes (I tried a pear, rosemary, goat cheese flammkuchen yesterday) and I am completely in love with this fruit! Your soup is now the perfect next dish I can try to sastisfy my pear addiction! Trish @ Well Worn Fork: Blue cheese is the best and I always enjoy working it into recipes! Globalspiced Blog: I don't use pears as an ingredient all that often but I do enjoy using it in savoury dishes! Love the concept of this soup. I do have a question. The instructions show adding the cream with the broth and potato, but also adding it at the end. How much cream each time? Jan P: All of the cream is added the first time and the second mention of it was a mistake and I have removed it. Thanks and enjoy!